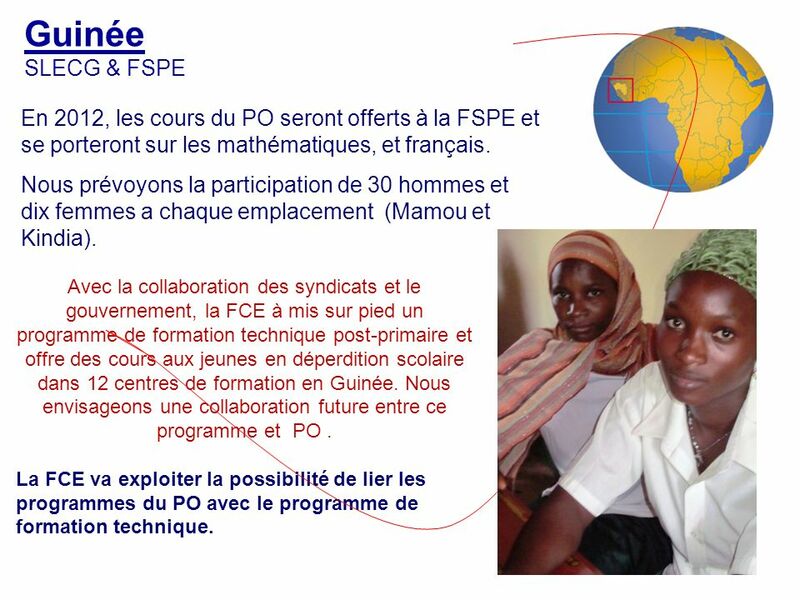 2 Guinée SLECG & FSPE En 2012, les cours du PO seront offerts à la FSPE et se porteront sur les mathématiques, et français. Nous prévoyons la participation de 30 hommes et dix femmes a chaque emplacement (Mamou et Kindia). Avec la collaboration des syndicats et le gouvernement, la FCE à mis sur pied un programme de formation technique post-primaire et offre des cours aux jeunes en déperdition scolaire dans 12 centres de formation en Guinée. Nous envisageons une collaboration future entre ce programme et PO. La FCE va exploiter la possibilité de lier les programmes du PO avec le programme de formation technique. 3 Togo FESEN Le premier PO au Togo a eu lieu en 1967. En 2012, les cours offerts par la FESEN porteront sur lanimation dateliers, la psychologie des enfants et des adolescents, les mathématiques, et la gestion des grands groupes. Ces cours seront donnés à Kara, situé à 400 km de Lomé. Le renforcement des capacités et légalité entre les sexes sont aussi des composantes de notre programme au Togo que nous avons lintention de poursuivre à lavenir. Dans lavenir, nous prévoyons intégrer PO avec la scolarisation des filles. 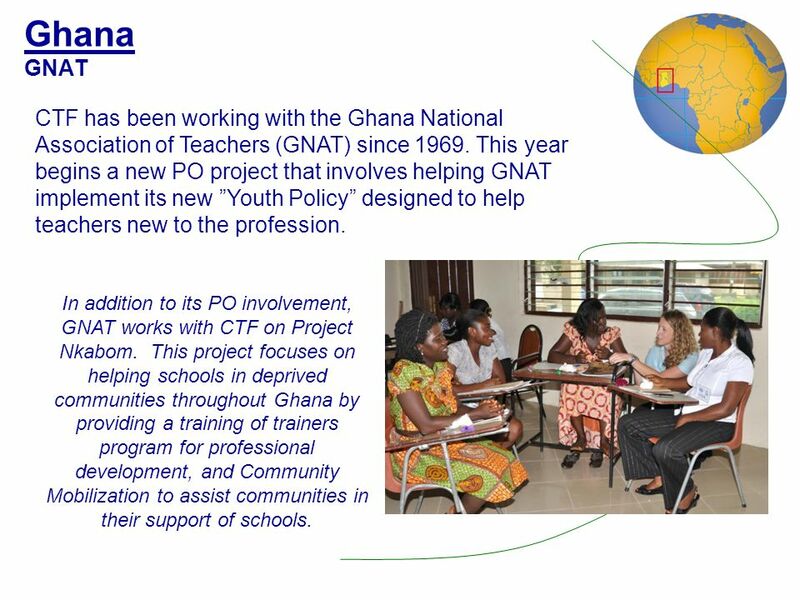 4 Ghana GNAT CTF has been working with the Ghana National Association of Teachers (GNAT) since 1969. This year begins a new PO project that involves helping GNAT implement its new Youth Policy designed to help teachers new to the profession. In addition to its PO involvement, GNAT works with CTF on Project Nkabom. This project focuses on helping schools in deprived communities throughout Ghana by providing a training of trainers program for professional development, and Community Mobilization to assist communities in their support of schools. 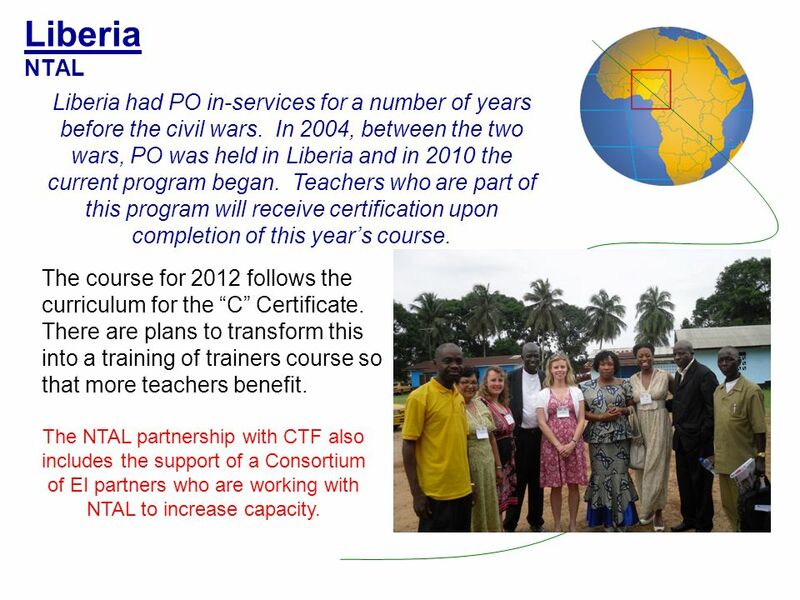 5 Liberia NTAL The course for 2012 follows the curriculum for the C Certificate. There are plans to transform this into a training of trainers course so that more teachers benefit. Liberia had PO in-services for a number of years before the civil wars. 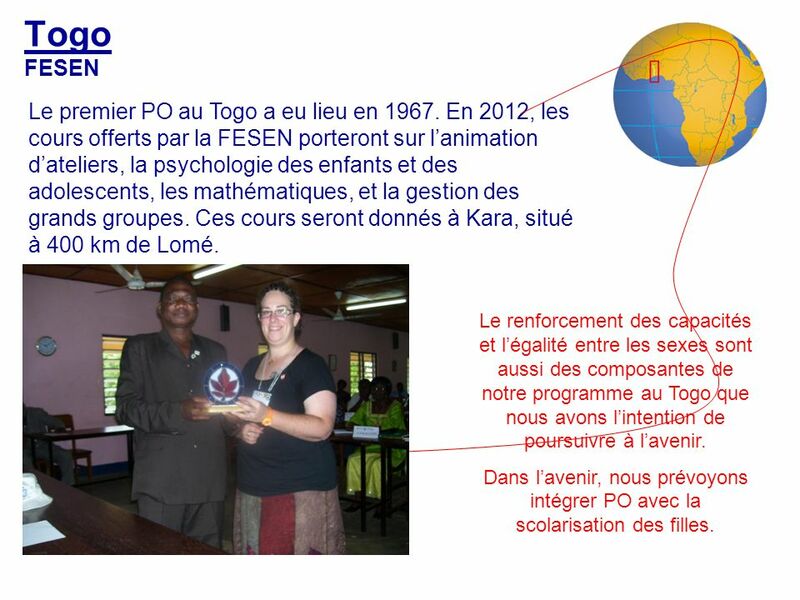 In 2004, between the two wars, PO was held in Liberia and in 2010 the current program began. Teachers who are part of this program will receive certification upon completion of this years course. The NTAL partnership with CTF also includes the support of a Consortium of EI partners who are working with NTAL to increase capacity. 6 Sierra Leone SLTU This year, the courses requested for untrained teachers are ELA, Math, Environmental Science and Social Studies. The Peace Education component is provided to teachers and school heads from clusters of rural schools. CTF also supports SLTUs newsletter and gender equality projects. It is anticipated that CTF will continue support for SLTU, and will increase cooperation with other teacher organizations who work with SLTU. The first PO in Sierra Leone took place in 1971. 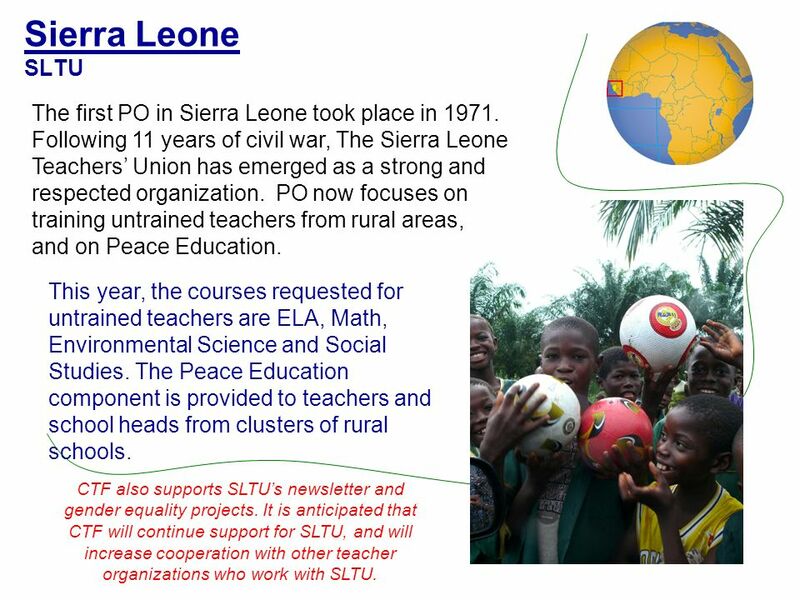 Following 11 years of civil war, The Sierra Leone Teachers Union has emerged as a strong and respected organization. PO now focuses on training untrained teachers from rural areas, and and on Peace Education. 7 Uganda UNATU The first PO in Uganda took place in 1967. This year will be the second year of a three-year Training of Trainers project that has literacy and numeracy as a focus, and concentrates its efforts in Bulera, a region that is lagging in these areas. UNATU is emerging as a strong African teachers union. It is expanding the Teachers Action for Girls project and CTF continues to work along side UNATU providing technical assistance as they work with schools, communities government and civil society to establish child friendly schools and increase enrolment and completion rates for girls. 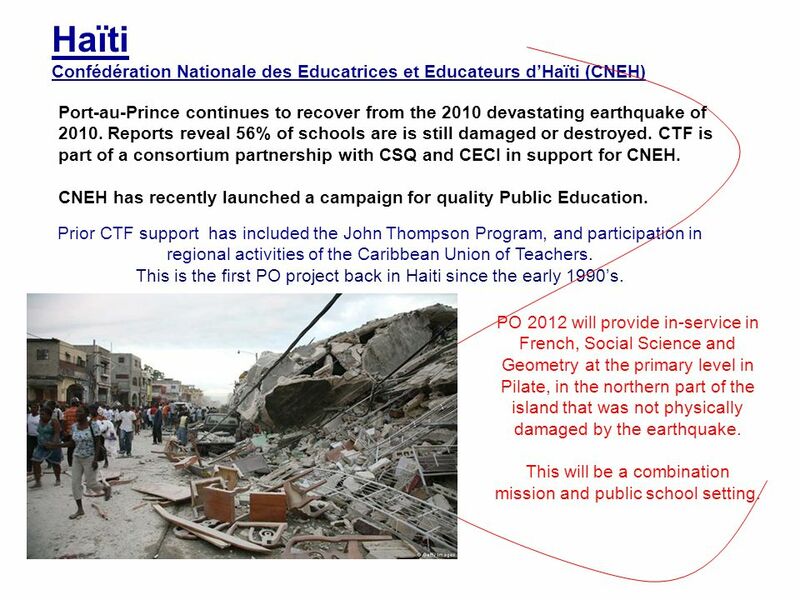 8 Haïti Confédération Nationale des Educatrices et Educateurs dHaïti (CNEH) Prior CTF support has included the John Thompson Program, and participation in regional activities of the Caribbean Union of Teachers. This is the first PO project back in Haiti since the early 1990s. PO 2012 will provide in-service in French, Social Science and Geometry at the primary level in Pilate, in the northern part of the island that was not physically damaged by the earthquake. This will be a combination mission and public school setting. Port-au-Prince continues to recover from the 2010 devastating earthquake of 2010. Reports reveal 56% of schools are is still damaged or destroyed. CTF is part of a consortium partnership with CSQ and CECI in support for CNEH. CNEH has recently launched a campaign for quality Public Education. 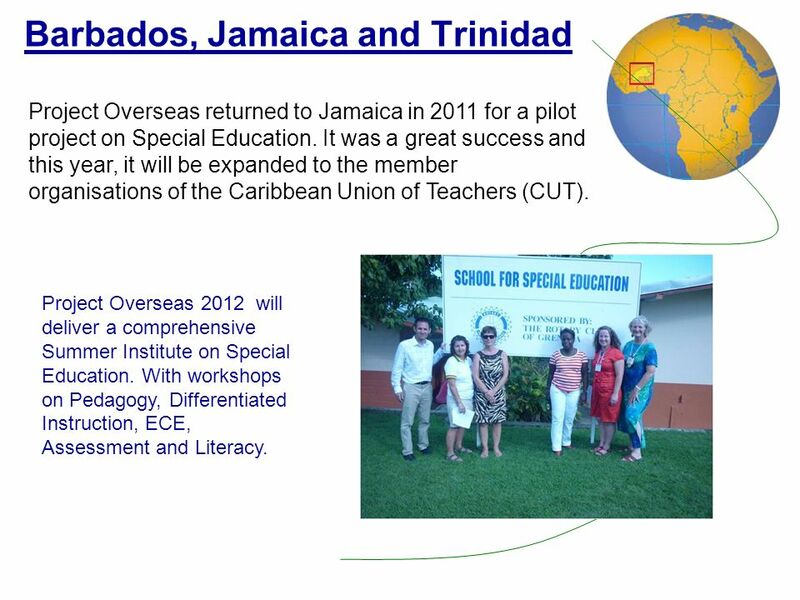 9 Barbados, Jamaica and Trinidad Project Overseas returned to Jamaica in 2011 for a pilot project on Special Education. It was a great success and this year, it will be expanded to the member organisations of the Caribbean Union of Teachers (CUT). Project Overseas 2012 will deliver a comprehensive Summer Institute on Special Education. With workshops on Pedagogy, Differentiated Instruction, ECE, Assessment and Literacy. 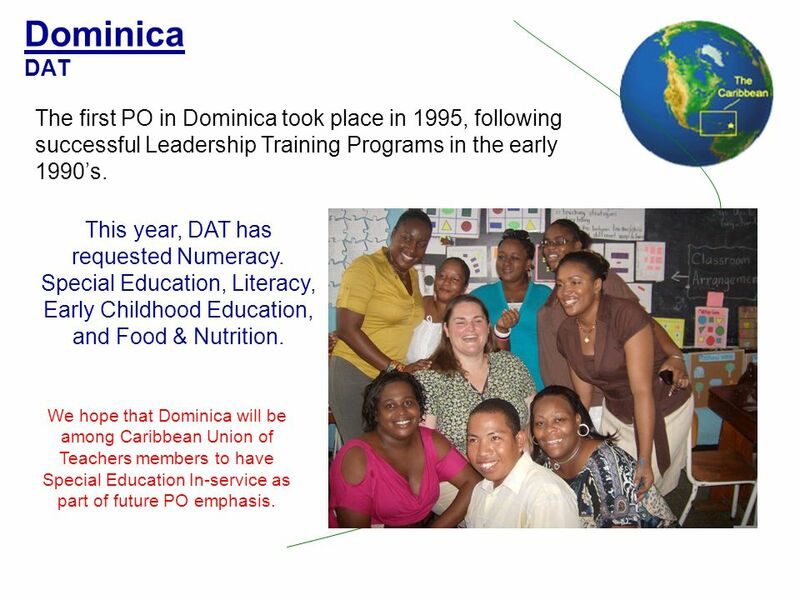 10 Dominica DAT The first PO in Dominica took place in 1995, following successful Leadership Training Programs in the early 1990s. We hope that Dominica will be among Caribbean Union of Teachers members to have Special Education In-service as part of future PO emphasis. This year, DAT has requested Numeracy. Special Education, Literacy, Early Childhood Education, and Food & Nutrition. 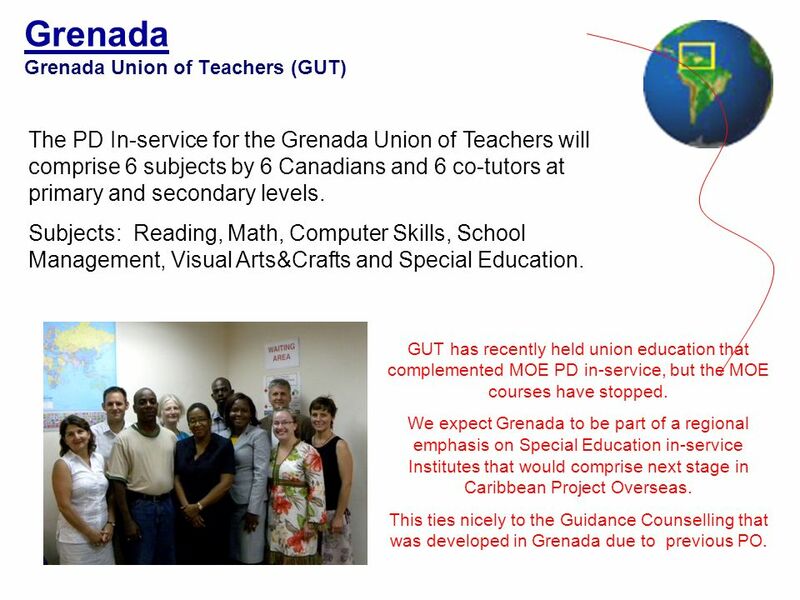 11 Grenada Grenada Union of Teachers (GUT) The PD In-service for the Grenada Union of Teachers will comprise 6 subjects by 6 Canadians and 6 co-tutors at primary and secondary levels. Subjects: Reading, Math, Computer Skills, School Management, Visual Arts&Crafts and Special Education. GUT has recently held union education that complemented MOE PD in-service, but the MOE courses have stopped. We expect Grenada to be part of a regional emphasis on Special Education in-service Institutes that would comprise next stage in Caribbean Project Overseas. This ties nicely to the Guidance Counselling that was developed in Grenada due to previous PO. 12 Saint Vincent SVGTU PO was in St Vincent throughout the 1970s, and again since 1994. The teacher leaders of Saint Vincent are very capable and able to help in-service programs reflect a local perspective. 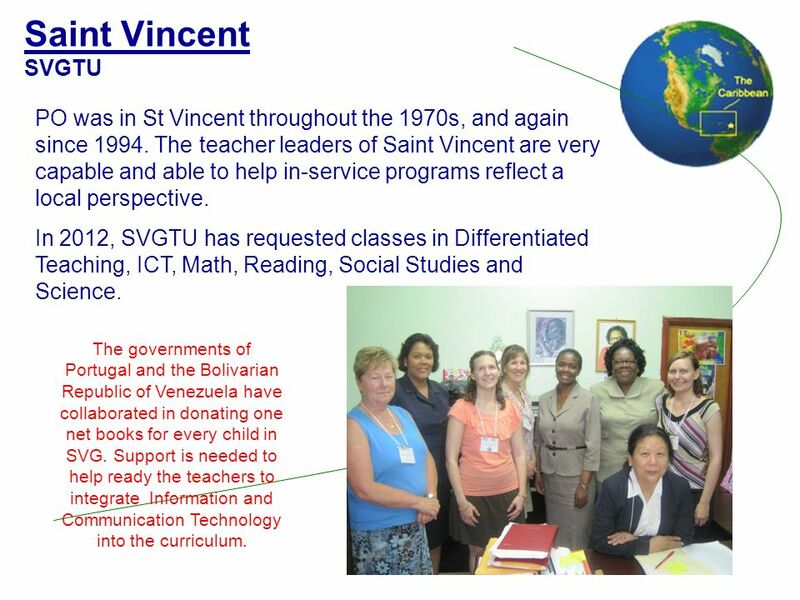 In 2012, SVGTU has requested classes in Differentiated Teaching, ICT, Math, Reading, Social Studies and Science. The governments of Portugal and the Bolivarian Republic of Venezuela have collaborated in donating one net books for every child in SVG. Support is needed to help ready the teachers to integrate Information and Communication Technology into the curriculum. 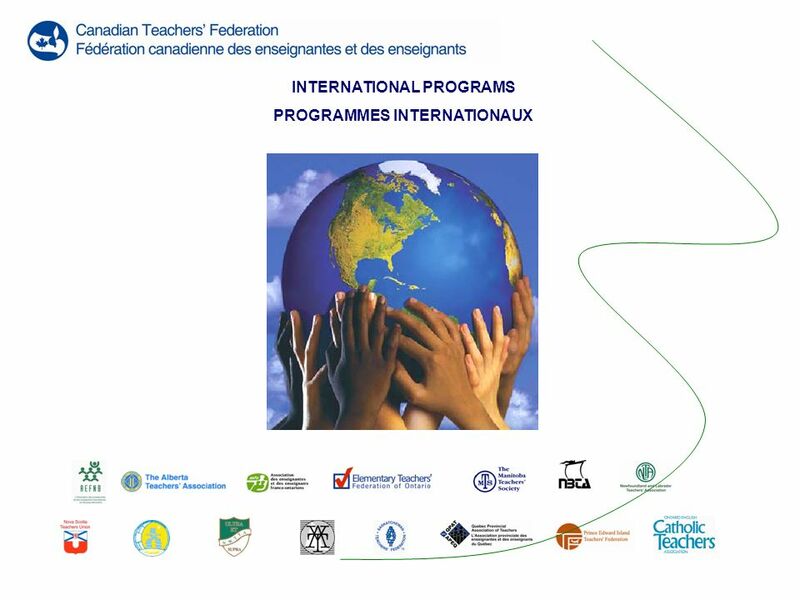 Télécharger ppt "INTERNATIONAL PROGRAMS PROGRAMMES INTERNATIONAUX." Linterculture. St martin St Martin Portugal SAINT MARTIN 86 Km2 En 1648, lîle de Saint-Martin nétait occupée que par quatre Français et cinq Hollandais.